So, after a long and difficult day at work, it is hard to keep that energy up to go out and enjoy yourself. Often, you just want to crash, throw those feet up, and take a nice long nap until the morning comes… Of course, the problem with that is that once that morning sneaks up on you, it’s just time to repeat the whole process. That’s nuts! But, fortunately, you are not at a total loss. There is a way to fix this problem. You just have to channel energy from some of the endless supply held by some of the world’s critters. You’ve heard of the idea of squirreling away energy for the coming days, right!? Well, where do you think that came from!? With their darting tails and faster feet, most of us are still trying to put together what’s going on by the time that the little suckers are off to their next mission. 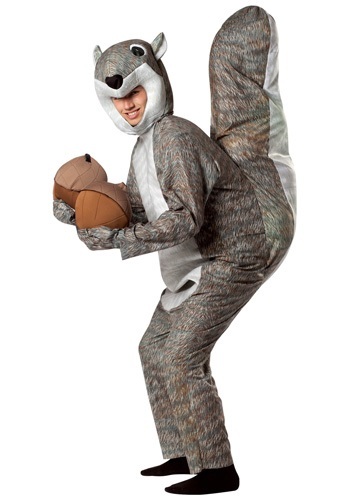 It is time to join the nut brigade and hop into this amazing Squirrel costume! This polyester jumpsuit has off-center hooks for easy fitting and a vinyl tale that inflates to stand up on its own—no personal energy expenditure required! The foam hood has an inner fabric for comfort and has the adorable squirrel face printed on it so you’re sure to get all the grins all night long. You can even stuff the hood to give you a chubbier and squishier face! Mitts connect with the jumpsuit by the same hook and loop fasteners. Now, just grab your nuts---stuffed accessories, of course---and prepare to win all the gloried attention from your friends. ABSOLUTELY INCREDIBLE I LOVE IT SO MUCH AND IT FITS PERFECTLY VERY VERSATILE SOMETIMES I WEAR IT ON OCCASSIONS OTHER THAN HALLOWEEN SUCH AS MY NEPHEWS FOREST THEMED BIRTHDAY PARTY!!! !